If you are going to bathe your horse, do it today. Even if you aren’t showing up until tomorrow afternoon, if you bathe tomorrow, the best case scenario is that your horse will look like a dandelion puff. Worse is that your horse would not be dry. Take it *very* easy on the “product”. By that I am referring to de-tangler, show-sheen, hoof polish, glitter, paint, oil, and any of the other things you might consider putting on your horse. None of you are going for a certificate that would benefit from “product”. Clean is good. Make-up isn’t. Plan on showing up at least 30 minutes early and make plans that allow you to be several hours later than expected. Pack all the stuff you plan to take (tack, brushes, books, etc.) tonight. Remember the extra stuff you may not have been thinking about: USPC pin, polo wraps/tape/pins/etc. (for D3′s), jumping boots if you have them. Take a hole punch. Take an extra bridle. Take an extra halter. Take extra stirrup leathers if you have them. If your horse has been longed and you have the equipment, take it. If your horse is really bad, that could be used as part of the solution, but only if you have the equipment with you. Run your saddle pad through the washing machine and dryer if it is even sort of dirty. Fill out your stall card tonight. Bring it. Remember to take TPR on your horse (temperature, pulse, respiration) at rest. Make sure the numbers are inside the normal range. Take a picture of your horse and put it on the stall card. Make sure every page of your record book is complete and the summary is filled out. Put the record book in a folder or binder all by itself. It is best if you have a picture of the horse with the record book. MAKE SURE YOUR NAME IS ON THE RECORD BOOK. Bring a complete change of clothes that you *could* ride in that is safe even if nothing else about it is ideal. You never know what will happen. Relax. If you are nervous and tense, nothing will go as well as it could. It will be ok. The worst case is that you re-take the whole test in the fall. You won’t be the first, nor the last. I failed a lot of certificates on the way up. It is *not* a big deal. Smile and act like everything that happens is something you expected. Work together with other candidates when answering questions. First person takes the *single* hardest answer they are *sure* of. Then the next person and so on. When everyone else has given all the answers they can, and you know more, ask the examiners if you can give more answers. If they say yes, give good answers as long as they are smiling and nodding. Don’t say “I don’t know, but…” or “I guess….”. If you are unsure, but you think you know an answer, give the answers you know first and then if you have to, say “I think I remember reading/hearing that …..”. Depending on the certificate you are going for and the question being asked, if you are not getting the answer the examiner obviously wants to hear, try to get some guidance for what they are looking for. As an example, if you are working on conformation faults and they keep asking for more but you have named all you can think of, ask if there is a specific part of the body that they would like to hear another conformation fault on. Be creative and respectful and you can get examiners to give you surprising amounts of hints. The examiner is right. Do not argue. If you disagree, you can ask for clarification. You can even ask them to explain how their statement and what you read in the manual can both be true (that is a nice way of saying the examiner is wrong). If you do that last one, be ready to bring the manual and prove that you are right. Do not say “But my instructor says to …”. The examiner is right. If they ask you to do something you cannot or will not do, you will probably not pass that part of the test but do not argue with the examiner. Leave the circle where the group has been asked to ride. Trot/Canter if you have not been given permission to. If the examiner asks you to jump a jump that does not have a groundline or is incorrectly set. Ask the examiner if they really want you to jump that jump and clearly explain why it bothers you. Chances are very good that you either misunderstood and would have done it incorrectly or they will change the jump to make you happier. If your horse does not pick up the correct lead, crow-hops, bucks, or breaks out of a gait, you have not failed. If your horse refuses that is not a problem. You have not failed. If your fall off, you still have not failed. It is what you do *after* falling off or refusing that determines if you pass or not. That can even be an opportunity to gain an “exceeds the standard” if you handle the situation well. 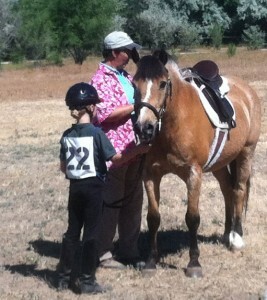 Even when you are not officially being tested, still follow Pony Club rules. Take your tack off after riding when you tie your horse up. Make sure your horse is properly tied in a safe place. Brush/sponge your horse after riding. Keep yourself neat and clean. Make sure you have appropriate footwear on when you are around the horses. Unless the examiners specifically tell you differently, keep the appropriate footwear on at all times (unmounted knowledge, riding, grooming, loading and unloading your horse). Save the flip-flops for the car ride home. Knowing the parts of the horse (anatomy) is important for anyone who rides, owns, or cares for a horse. The ability to identify where an injury is located and tell the veterinarian over the phone can save time, fear, and money. Riding lessons often include phrases such as “Reach forward and touch the poll, then back to touch the dock”. Without knowing where the poll and dock are, the rider cannot perform the exercise. As a more experienced horseman, the knowledge of the parts of the horse is involved in discussions about purchasing an animal or determining the reason a horse is lame. At this level, the horseman is expected to be comfortable discussing horse anatomy and the soundness issues related to different ways that anatomy is put together. Still more experienced horsemen who breed horses, own or manage barns, assist veterinarians, or seek to become farriers need to know more about the anatomy of the horse. These people need to understand how ligaments, tendons, and muscles connect to the bones and how those parts are affected by different conformation. That knowledge depends on first knowing the names and locations of the parts. USPC defines a set and standards for each level of achievement. The specific sections related to parts of the horse for D1-C2 are included below.